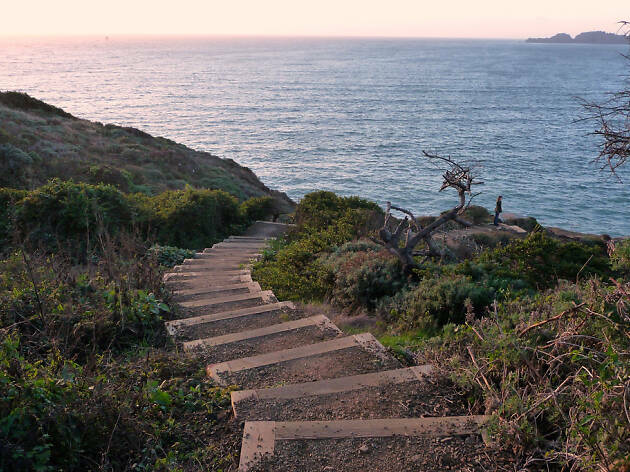 For the days when you feel stuck behind your desk or mired in the glut of devices around you at every coffee shop and café in San Francisco, an urban hike in San Francisco or Marin or Oakland might be just what you need. 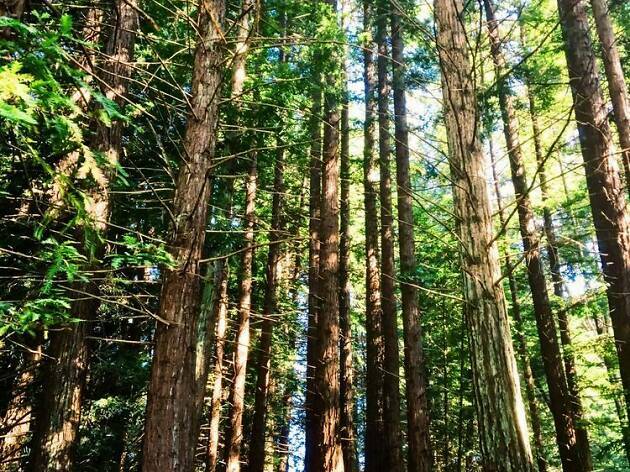 Listed among some of the very best things to do in San Francisco, this city's urban hikes promise fresh eucalyptus-scented air, open cliffs, stunning views of the ocean, redwood forests and a free workout to boot. So, if you’re feeling the need to escape the city, but don't have time for a full day trip from San Francisco, just step outside and let your feet show you the way. 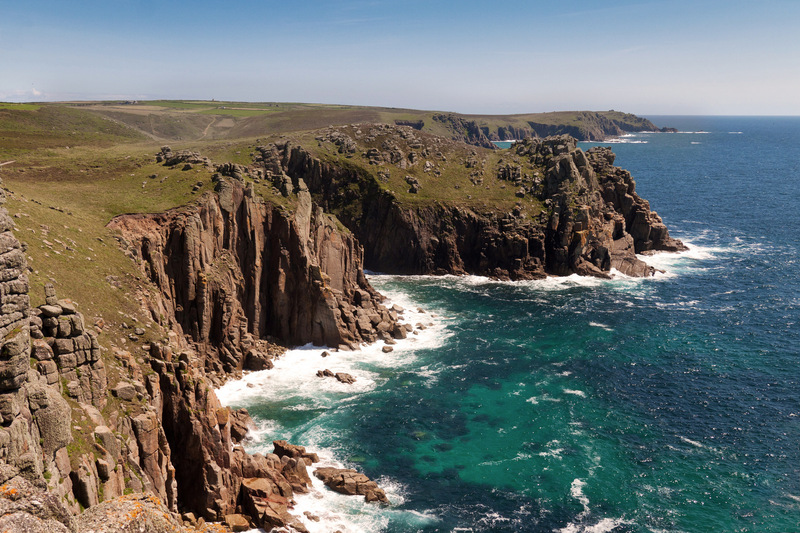 Lands End offers all the drama of windswept cypresses and cliff faces descending into the crashing ocean, all within city limits. Start at the parking lot by the Lands End Lookout (with a visitor center and café) and take the Coastal Trail heading east. 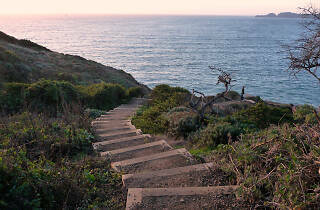 The gentle path takes you all along the coastline and up to the Eagle’s Point Overlook, a popular vista and photo spot. 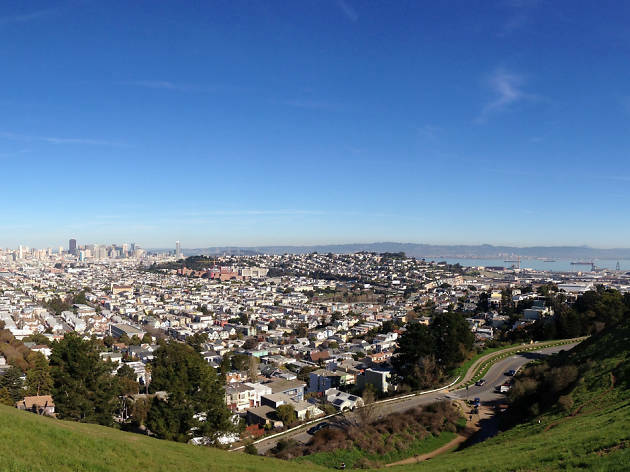 Bernal Heights Summit rivals Twin Peaks as the best vantage point for a 360-degree view of the city. It’s a short one-mile loop, but it can get steep. You’ll be surrounded by dry grassland most of the year, but after the winter rains, the hill is covered in lush greenery and wildflowers, like shooting stars, checkerblooms and California poppies. 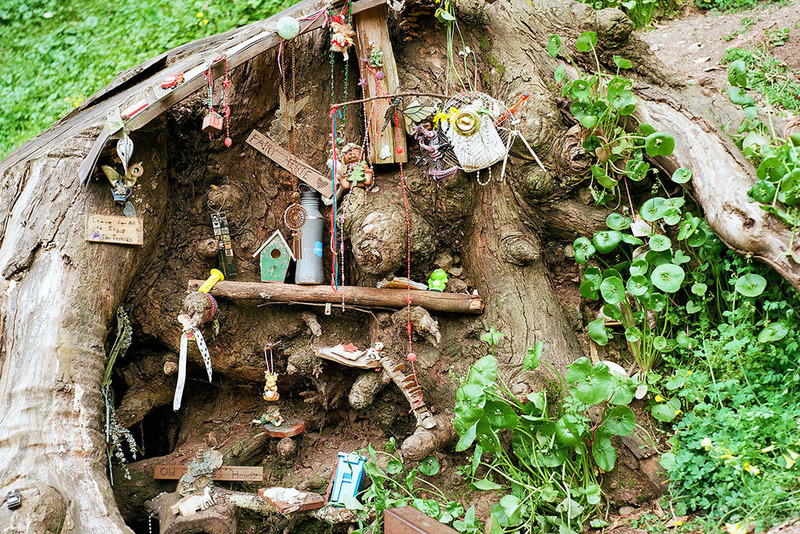 This dramatic park on San Francisco’s south side is one of the city’s best kept secrets. 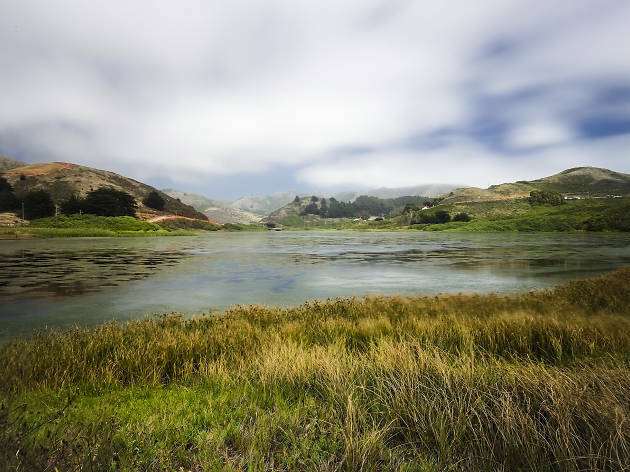 There are no tourists here—most San Franciscans don’t even know it exists—just a slow trickle of dog-walking neighbors and, in the summer months, kids attending camp. There’s one main trail, the Glen Canyon, which loops out from the tiny parking lot on Bosworth St. 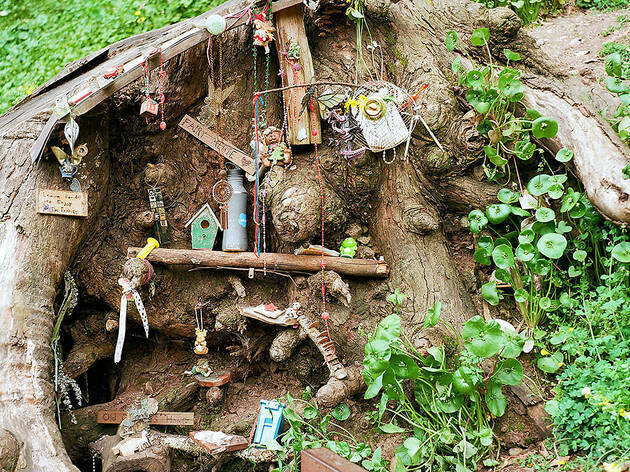 Follow the wide trail into the canyon and keep left if you want to get a glimpse of the whimsical fairy houses on the trail’s edge. 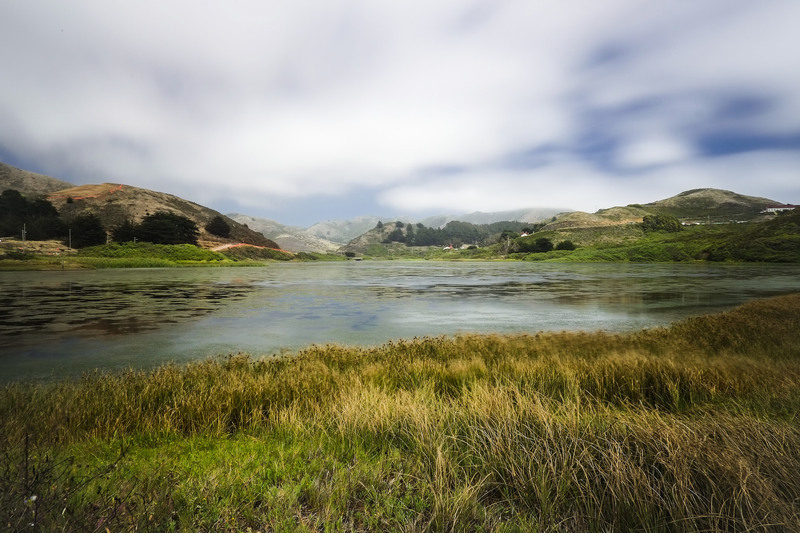 A short hop across the Golden Gate will take you to the 2,000-acre expanse of the Marin Headlands, a veritable nature-lover’s playground. 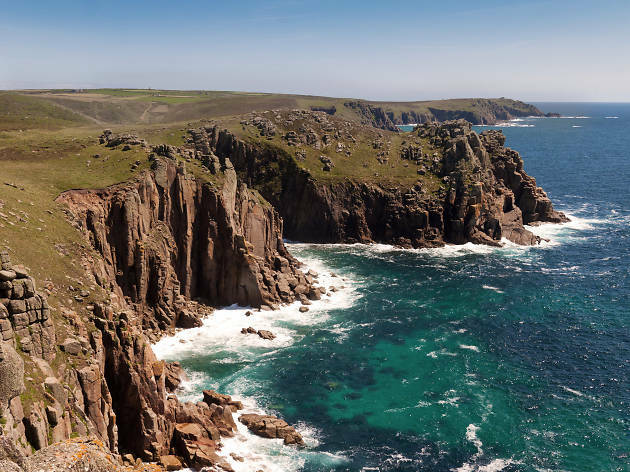 The Headlands are criss-crossed with trails of varying difficulty and terrain; you can choose to hug the cliffside along Jurassic rock formations, tread through tranquil woodland, or stroll along protected pebble beaches. Two routes, however, are not to be missed: the Point Bonita Trail and the Rodeo Lagoon Trail. 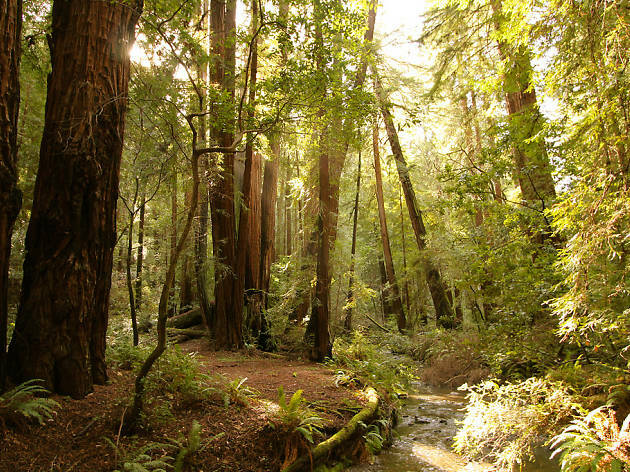 You don’t have to go to the North Bay to bathe in the beauty of California’s redwoods; the East Bay has its own forest of gentle giants worth a visit. There are plenty of trails and trailheads from which to launch your hike at the aptly named Redwood Regional Park but the large parking lot at the Skyline Gate Staging Area ($5 fee, $2 extra for dogs) is an easy choice. From here, follow the West Ridge Trail from the lot’s south side through a canopy of eucalyptus, madrone, bay and hazelnut trees (with nuts ready to eat in September and October). Turn left onto the Tres Sendas Trail and enter the land of the redwoods, a quiet, creek-crossing trail blanketed by pine needles. The magic of Muir Woods is that it’s one of the only remaining old-growth redwood forests in the Bay Area. The cool hush of this thousand-year-old forest, with a floor teeming with all manner of fungi, ferns and wood sorrel is a still counterpoint to the musical Redwood Creek (spawning grounds for Coho and Steelhead Salmon, visible until early March). Alongside the creek, there are three loops of varying lengths: ½-hour, 1-hour and 1 ½-hours. Further afield, dirt trails run along the canyon and branch off into nearby Mount Tamalpais State Park. The loops are paved (or on boardwalks), but given the amount of fog and moisture hanging in the forest air, the steeper dirt trails can get muddy, so come prepared. 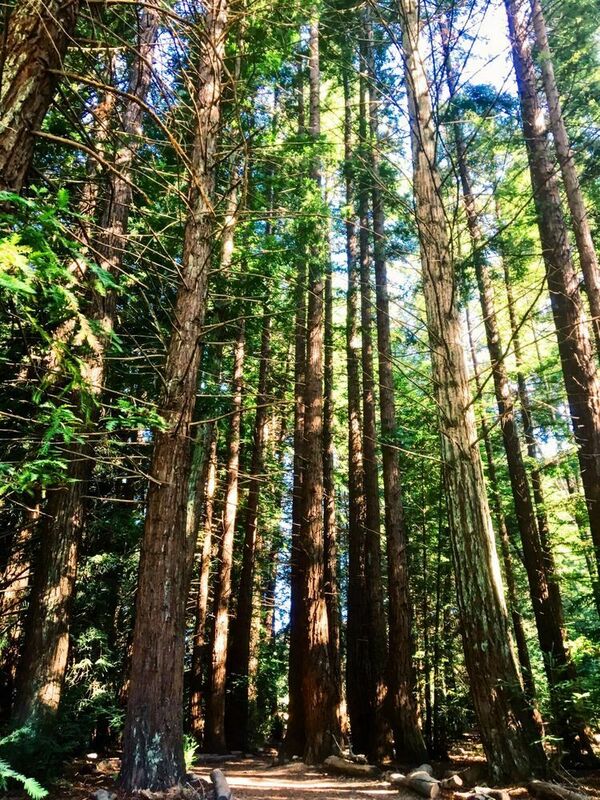 Keep an eye out for the "family circles" of redwoods along the Bohemian Grove Trail, where enormous redwoods grow in circles around a parent root, stooping over in reverence. 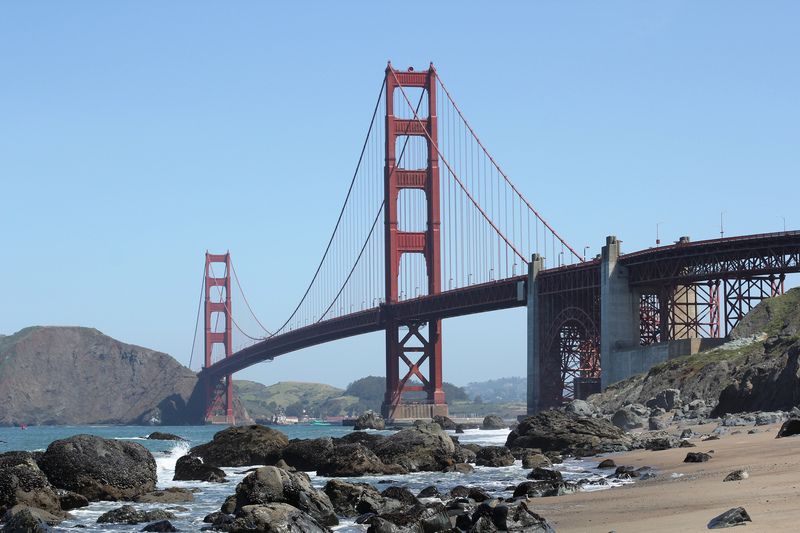 On a bright, sunlit day, the Golden Gate Bridge is a disarming sight, an elegant feat of engineering straddling the steel blue expanse of the Bay. But why admire it from a distance, when you can get up close and personal? Start at Crissy Field Center (at the eastern end of the beach) and head west along the Golden Gate Promenade. 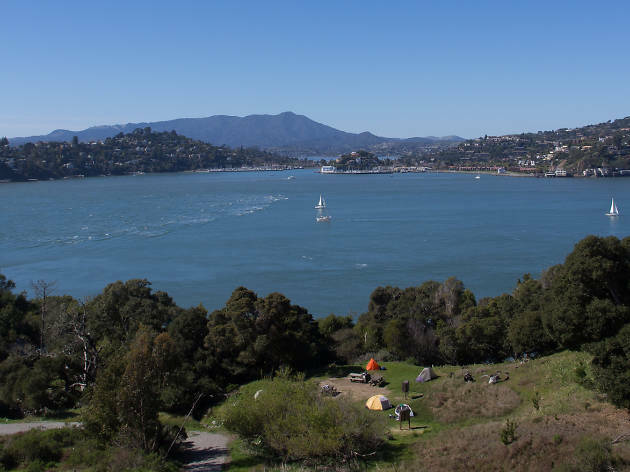 The largest island in the San Francisco Bay, Angel Island’s central location and paved perimeter road make it a popular hiking destination on weekends. Take the road less traveled and head up to the summit of Mount Livermore, the highest point on the island at 788 feet. From the ferry terminal, instead of turning right towards the Visitor Center, head left towards the North Ridge Trail. You’ll soon be on a dirt track, leaving the crowds far behind. The trail winds up at a gentle incline through shady groves of oak and pine, and you’ll catch glimpses of the Bay and its surroundings as you climb. As far as 360-degree views go, the summit of Mount Livermore might just be the ultimate one. 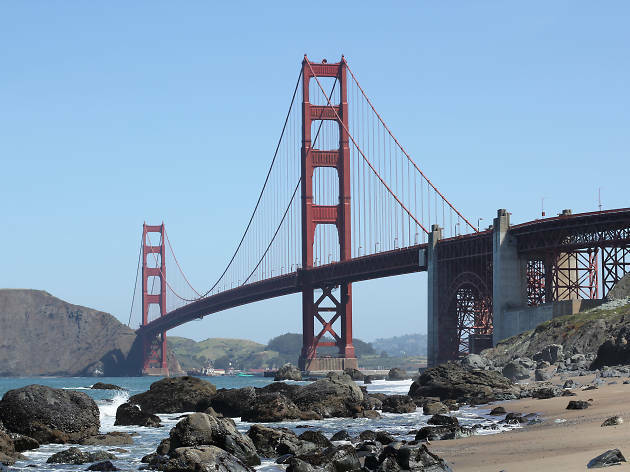 Once you’ve reached the top, you can take in three bridges (Golden Gate, Bay, and Richmond-San Rafael), the other islands (including Alcatraz), Oakland, Tiburon, Sausalito and San Francisco.